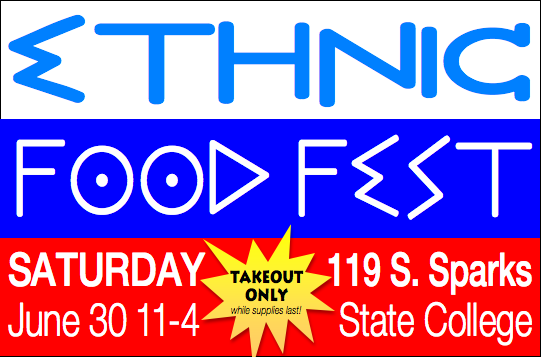 Attention food lovers: Various ethnic entrees and sides will be featured at the State College Ethnic Food Fest hosted by Holy Trinity Orthodox Church (119 S. Sparks St., between College and Beaver Avenues) on Saturday, June 30 starting at 11 a.m. and continuing until 4 p.m., or while supplies last. 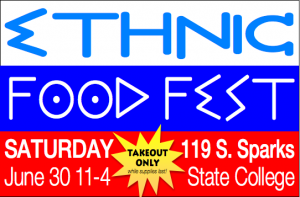 There will be several homemade Russian, Greek, and Eastern European specialities available for takeout, including holupki, halushki, borscht, pirogi, kolachi, koulourakia, makovník, and orechovník. All proceeds from the bake sale will benefit a construction mission team that will be serving the village of Marshall, Alaska from July 22 through August 3. For more information or to be a part of this community event, contact info@holytrinity-oca.org or call (814) 231-2855.